It’s been wonderful being able to take a few minutes to document the things going on this month. This has been a bit like art journaling and diary keeping on a lighter scale. Day 11 was about the banner I created for Diemond Dies, which is having a wonderful Christmas giveaway on the Diemond Dies Facebook page. I also had made a funny masculine birthday card for a friend’s husband. 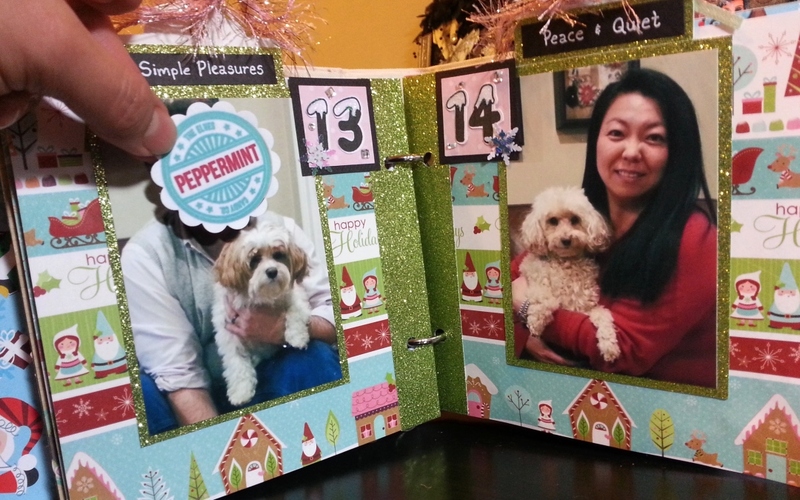 Day 12 was about the free digi I created, “Sweet Shar Pei”, and the card I made using the C.C. 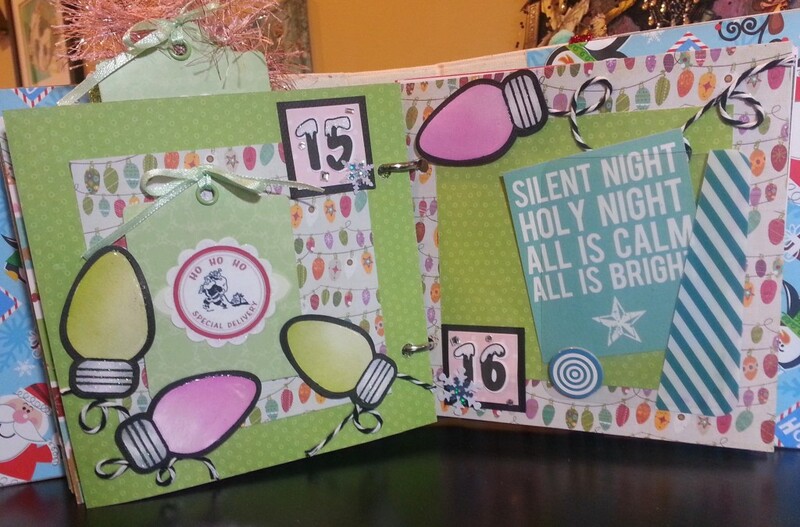 Designs “Snarky Christmas” stamp set and the Build A Snowman die set by Diemond Dies. The little pup is looking a bit sheepish I think, surrounded by the remnants of a snowman, and the speech bubble says “Dear Santa, define naughty…” I also journaled about picking the giveaway winner of my Christmas Blog Candy Giveaway. Lastly I slid in a sewed a mini acetate shaker for a little added fun. Days 13 and 14 were quiet weekend days. We ran errands, made doggy meat loaf for the coming week, and shared quality family time together. Family pics were snapped to help document the cozy good time. Day 15 was a rough one. We had a very stressful day fighting some terrible injustices related to my parents’ business. 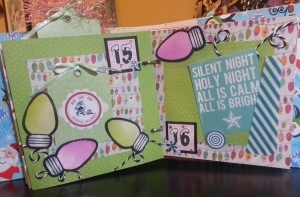 I thought adding the Christmas light patterned paper from the “Snowy Day” Crate Paper collection and some stamped and die cut Christmas lights from The Stamps of Life “Lights4Christmas” collection would be a great way to create a journaling tag holder while symbolizing the light at the end of the tunnel we hope to see. 🙂 I used black and white bakers twine and glued it down in a random swirly pattern to look like the cord of the Christmas lights. Day 16–today, was a quiet one. After a night fighting insomnia after the stressful day yesterday (more on that in the video below), I was a bit of a zombie. I didn’t get much crafting done, other than just working on my December Daily. Hubby had to travel for work, so it was just me and the fur babies hanging out at home. It was a good catch up day with just a little journaling to represent the day. The free printable that I had with the lyrics from “Silent Night” seemed a good fit for the day. How AMAZING is that book !!! 😀 Such a busy time you had. I hope it all works out in favour of your Parents. What a wonderful album. I love your pages. I hope all works out for your parents. Hugs to all.